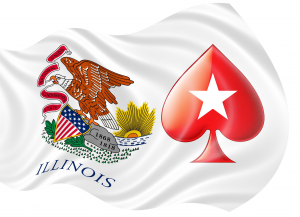 Illinois State Senator Terry Link has amended a proposed gambling bill to allow companies which have been charged with violating gambling laws to apply for licenses. The first draft of the bill would have prevent PokerStars and its sister company Full Tilt Poker from applying for an internet gambling license in the state as the companies had previously “accepted wagers” from US based players. However, the new bill has been modified as states that companies must be “convicted of accepting” wagers in order to be qualified. In 2012 PokerStars settled the charges against it for $731 million. The company spokesman, Eric Hollreiser, said “we admitted to no wrongdoing and in the process of that, we were given, the assets of our biggest competitor, Full Tilt Poker, by the Department of Justice. PokerStars had hired lobbyist John Jelly Jr, president and owner of All-Circo Inc to further its position in Illinois. State records show that Kelly is registered as lobbying for Rational Services LTD, a subsidiary of PokerStars’ parent company, The Rational Group. So far there has been no comment from Kelly.